MEET YOUR VANITY NEEDS: No worrying about the wiring issue, as it is built-in rechargeable lithium battery design. You could use it for around 7 days (each time 8 mins) after full charged. And it comes with a USB cable which is convenient for you to charge the battery by your power bank/ pc/ wall charger or a normal cell phone connector. Best white mirror to put on your desktop or tabletop to use. 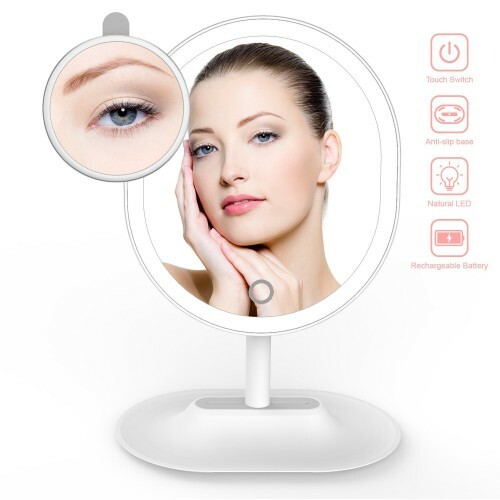 NORMAL/5X MAGNIFYING: This make up mirror have 1X/ 5X magnifying options, with 1X magnification to view your overall look, with a detachable 5X magnifying mirror on the back to see every detail and it can hang on the center of 1x mirror directly by magnetic adsorption. ADJUSTABLE LED LIGHTING: Adjust the led brightness through long press the circle on the mirror. 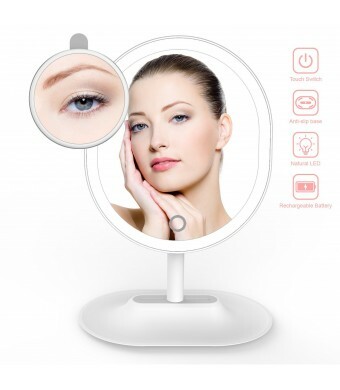 It can perfect meet the required brightness without dazzling eye strain and you can use it either on day or night. No need to worry about the replacement of the light beads because it is equipped with 16 durable LED light beads with a life span of 50000 hours nonstop, lasting up to 5 years of continuous use. PERFECT SIZE AND SPACE SAVING: This oval design mirror is in a perfect size that just fits the shape of your head. You could put your jewelries or other small objects on the base to save space on your vanity table and keep it clean. The base is non-slip and detachable with 4 rubber feet on the bottom. 100% GUARANTEED: Keeping you satisfied and providing you with the friendliest customer service is our number one goal. This is why we offer you a 30 days money back guarantee and a 12 month quality warranty! You've got the right idea if you're thinking about giving a mirror as a gift. This light up mirror will be a great choice, packaged well elegant makes it has enough margins to engrave best wishes.